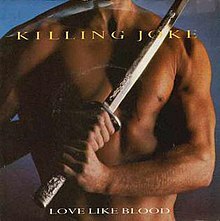 "Love Like Blood" is a song by English rock band Killing Joke. It was released in January 1985 as the second single from their fifth studio album, Night Time (1985). Produced by Chris Kimsey, the song was characterized as gothic rock and new wave. It was a top 10 hit in the Netherlands and New Zealand and peaked at number 16 in the UK. "Love Like Blood" was originally released by E.G. Records in January 1985 as a 12" in the UK, and a 12" maxi single in Germany. The 7" single on E.G. was released in the UK, the Netherlands and Germany. Polydor also released a 12" single in the Netherlands and a 12" maxi single in France. E.G. Records' 12" and 12" maxi singles’ A-sides featured the track "Love Like Blood (Version)", a different version of the song, and as B-sides, the radio version of "Love Like Blood" and "Blue Feather (Version)", the same track list as Polydor's release. E.G. 's 12" maxi single, released in Germany, featured the same tracks, as did Polydor’s maxi single released in France. E.G.’s 7" single exempted "Love Like Blood (Version)" and instead featured the radio version of "Love Like Blood" as the A-side. E.G. also released "Love Like Blood (Gestalt Mix)" in the UK as a 12" single. It replaced "Love Like Blood (Version)" with the remix as an A-side, and was limited to only 2000 copies. It later appeared on the 2008 reissue of Night Time, along with a completely different version of "Blue Feather" that did not appear on any of the releases of "Love Like Blood". "Love Like Blood" was reissued in 1998 as a 12" single by Butterfly Records, as a live remix, alongside a remix of the song "Intellect" from Killing Joke’s 11th studio album, Democracy. "Love Like Blood" was covered by several bands, and the German gothic rock band Love Like Blood took their name from this song. (2009) "Love Like Blood/Promise Me"
(2010) "Dance in the Neon Light with Lena Philipsson"
In 2010, the Swedish alternative metal band Dead by April released a cover version of "Love Like Blood" as a stand-alone single. The single was released 10 May 2010 on iTunes and as a double A-side single alongside previously released track "Promise Me" from their debut album Dead by April. No music videos were made for either of the tracks. "Love Like Blood" was the first track recorded by the band with their new singer Zandro Santiago, and was later included on their compilation album Stronger, released on 24 January 2011. ^ Manuel, Garreth. "Killing Joke – Perth, 9th June 2013". Caught in the Mosh. Retrieved November 29, 2017. ^ Soghomonian, Talia (March 5, 2009). "Release The Bats – It's The 20 Greatest Goth Tracks". NME. Retrieved November 29, 2017. ^ "Love Like Blood". Retrieved 19 December 2008. ^ Janovitz, Bill. "Love Like Blood – Killing Joke". AllMusic. All Media Network. Retrieved November 29, 2017. ^ "charts.org.nz - Discography Killing Joke". © 2006-2009 Hung Medien / hitparade.ch. Retrieved 2010-04-12. ^ "iTunes - Music - Love Like Blood / Promise Me - Single by Dead By April". Itunes.apple.com. 2010-05-07. Retrieved 2013-11-13. "Dance in the Neon Light"
This page was last edited on 4 April 2019, at 07:09 (UTC).